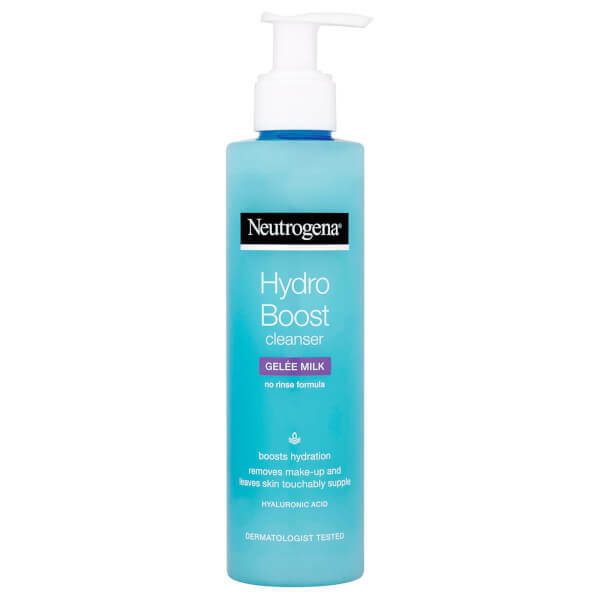 Experience a refreshing cleanse with Neutrogena Hydro Boost Gelée Milk Cleanser, an innovative face cleanser that combines the lightness of a gel with the effectiveness of makeup remover milk. Gently removing makeup and impurities from skin, the face wash purifies and refreshes; its combination of Neutrogena® Cleansing Technology, Hydrating Agents and Hyaluronic Acid work in synergy to protect skin whilst boosting and locking in moisture for a soft, supple and healthy-looking complexion. Apply with a cotton pad over face, eyes and lips. No need to rinse. [PR-017222], Aqua, Glycerin, Butylene Glycol, Sodium Hydrolyzed Potato Starch Dodecenylsuccinate, Polysorbate 20, Sodium Hyaluronate, Ethylhexylglycerin, Hydroxyacetophenone, Poloxamer 188, PEG-100 Stearate, Glyceryl Stearate, Acrylates/C10-30 Alkyl Acrylate Crosspolymer, Sodium Polyacrylate, Zea Mays Starch, Disodium EDTA, Sodium Hydroxide, Tocopherol, BHT, Parfum.